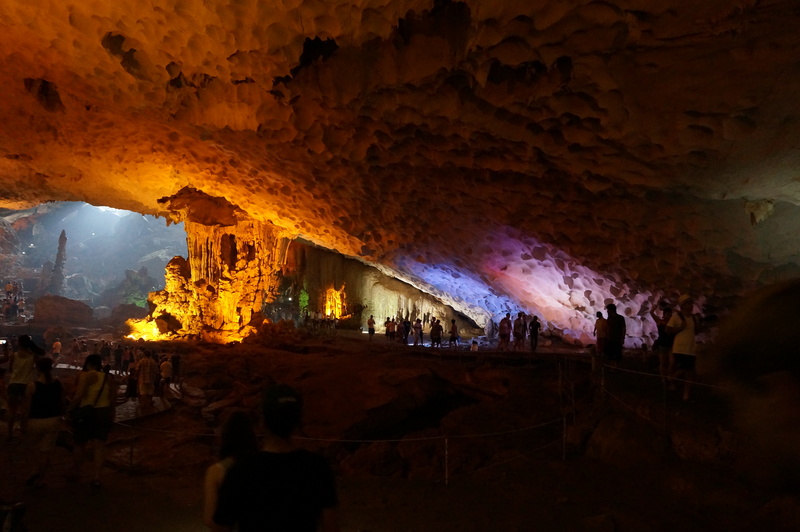 I had been planning and executing the first 18 days of my trip on my own, I decided to try something new and booked my remaining Vietnam adventures through a travel agent. I booked 4 adventures through them, the first was a 2 day 1 night cruise on the Halong Bay, Halong bay is made up of nearly 2,000 limestone islands that rise up dramatically from the ocean. The cruise was very nice. There were about of us on the boat and they fed us a lot of good food while putting around the bay. The bay was beautiful, though crowded with other cruisers. I would say it’s comparable to the Alaskan Inside Passage. Some highlights included climbing around some of the caves and kayaking into a lagoon only accessible via cave at low tide. This last part was surreal, something out of a pirate movie. In fact if I were a pirate this is where i’d hide my booty, arrrrr. 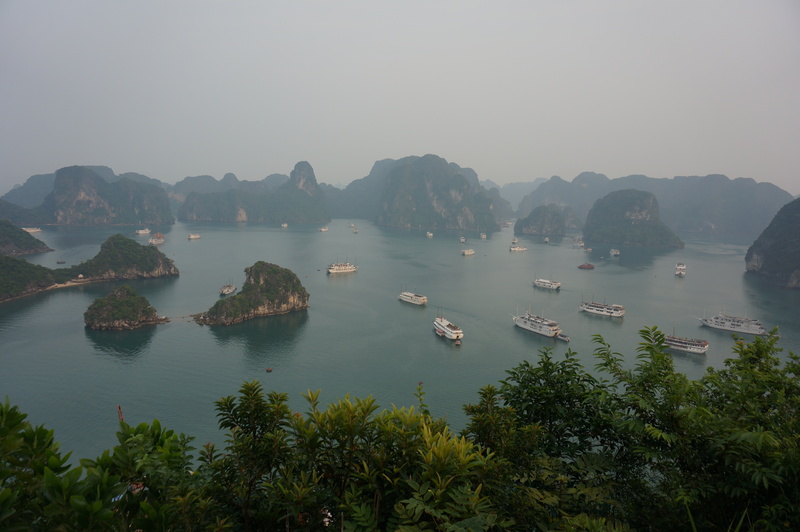 A few of the many islands in Halong Bay taken from the top of Ti Top island. It was a hazy day and you can see many of the cruise boats crowding the water. 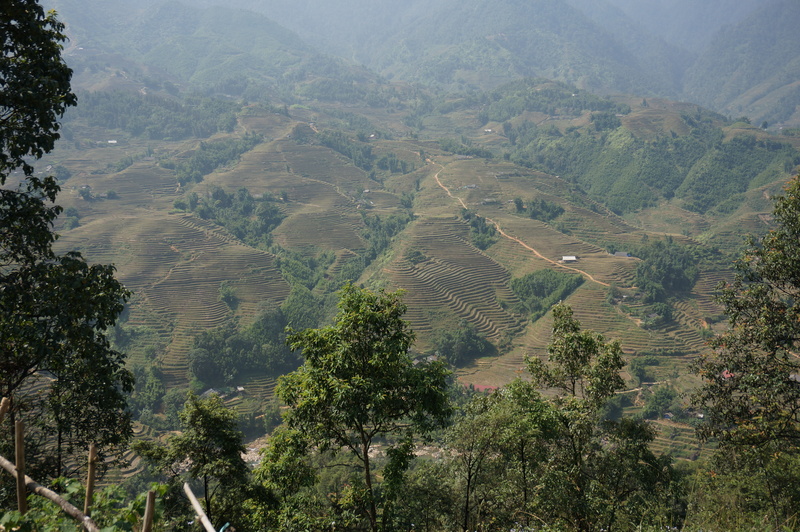 My second Vietnam adventure was a 2 day, 3 night Sapa Trekking trip. 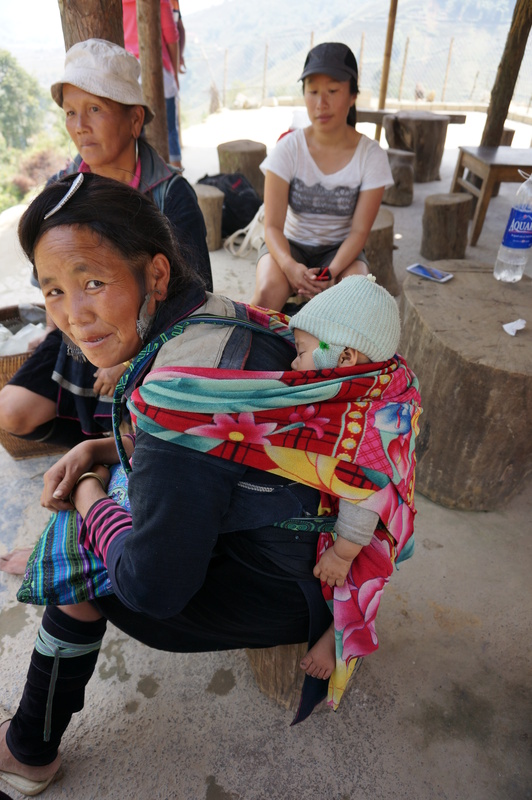 Sapa is in the northern tip of Vietnam and is famed for its dramatic tiered rice fields carved into the side of the hills as well as the many local tribes, many of whom speak their own language and no Vietnamese. 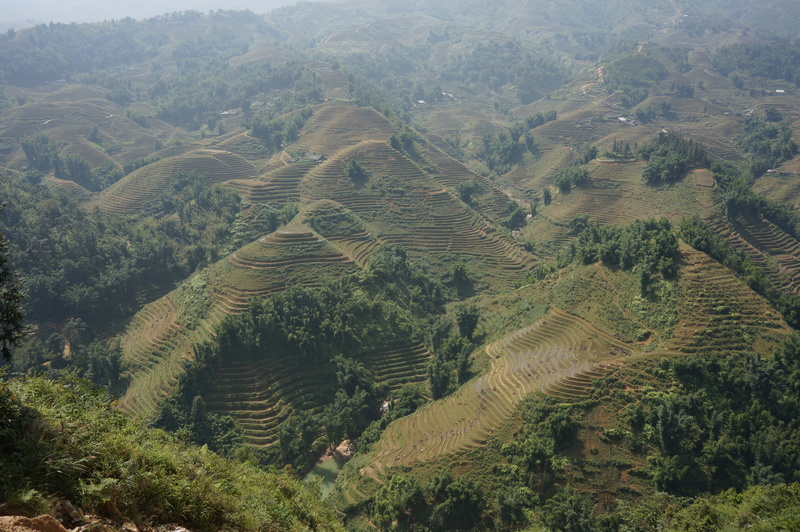 Getting to Sapa involved a night train from Hanoi (which was an adventure inandof itself) and I opted for a home stay experience rather than a hotel which meant that I was going to sleep at a local farmer’s house. Sapa is just beautiful and dramatic, easily my favorite stop on my SE Asia trip so far. Even the little town was charming, an Asian version of a Swiss mountain village, full of hiking shops, and little restaurants built into the hillside. 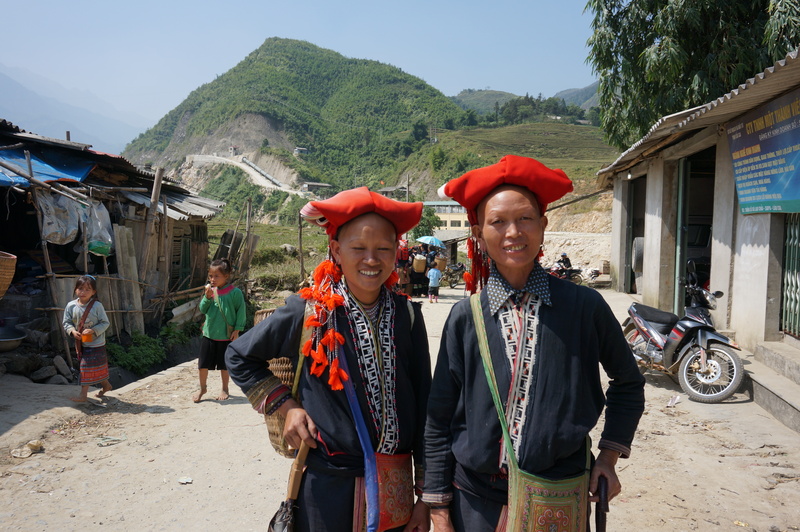 The local hill tribes, the H’mong and the Xia, dressed in their traditional clothing, hiked with us and each one would take a turn, “What’s your name”, “Where you from”. It was a little bit of an opportunity to interact, but of course there’s no such thing as a free lunch and near the end they wanted us to “shop” with them. 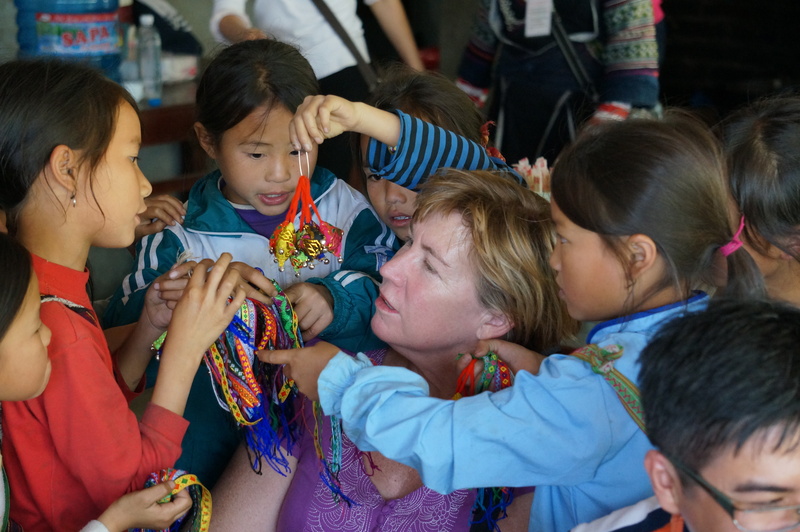 When we stopped for lunch we were swarmed by everyone, especially the children who are literally in your face trying to sell you bracelets and jingly things. A hiker being swarmed. Every time you’d say no, they’d say Yes. You say I already have one, they’d say One more. The “trek”, which was more of a downhill walk on day 1 but turned into a decent hike on day 2, took us into the rice paddies over rivers and through some of the prettiest countryside I have seen. I was a little anxious about the homestay but it turned out to be one of the best parts of the trip. 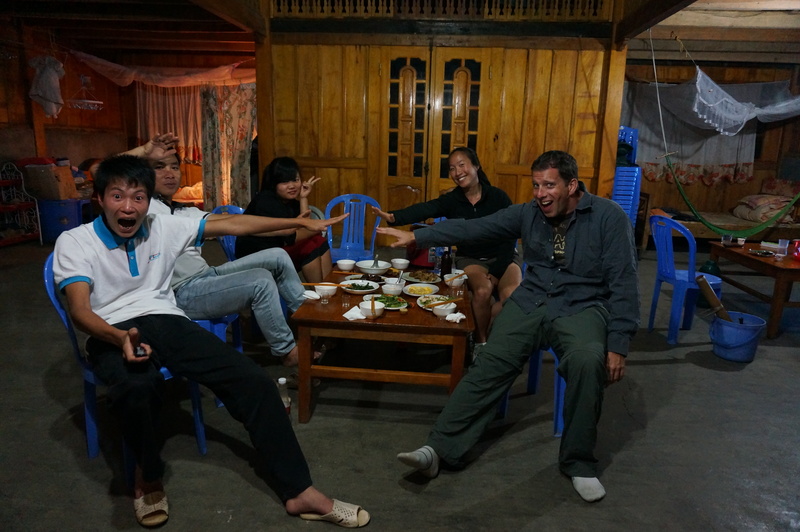 There was one other backpacker on the homestay trip and we were fed a good meal and sat around after talking and learning about the local life. The highlight was our tour guide, a man named Duong. He was just hilarious, and I don’t think he meant to be, but he had me in tears. I had brought a deck of cards and he kept trying to show us a magic trick that never worked and was “feigning” shoving things up his nose, making inappropriate sounds. Good times. Great post, Scott. Really enjoyed it.